The end of summer is near and I will miss the seasons colorful fruit. When I entertain for summer events, my favorite displays are the colorful platters I purchased in Europe filled with delicious locally grown fruit and vegetables. Yellow is the color of peace and when you blend that with other rich summer colors, the table is a picture of joy. The ‘Yellow Crimson’ has a yellow-colored flesh. 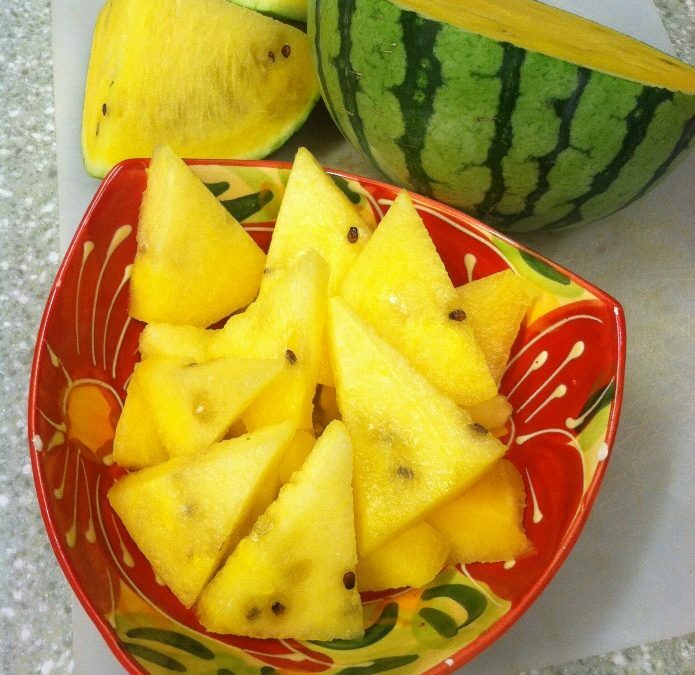 It has been described as sweeter and more honey-flavored than the more popular red-flesh watermelon. Enjoy the sweet benefits of the end of summer watermelon. According to a new study in the Journal of Agricultural Food and Chemistry, drinking watermelon juice before a hard workout helped reduce athletes’ heart rate and next-day muscle soreness. That’s because watermelon is rich in an amino acid called L-citrulline, which the body converts to L-arginine, an essential amino acid that helps relax blood vessels and improve circulation. Join the mailing list to receive the latest updates from Eating Off The Vine and Cooking Off The Vine!